Every day we move forward, and we must leave things behind. Sometimes those items are eagerly cast aside and promptly forgotten. Other times, traces linger in our subconscious and flutter and flicker in our mind's eye. Today, it seems appropriate to begin a list of things that I miss. 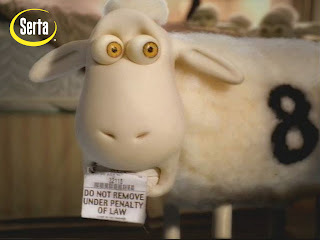 I Miss. . .good, clean entertainment on television and in the movies - shows without blatant sexual scenes and excessive violence and profanity. I Miss. . .the age of innocence when children were encouraged to play and be creative. As a society we force children to grow up too quickly. I Miss. . .seeing the world through the eyes of a child. Many of you are probably too young to remember Art Linkletter, but I always loved the final segment of his show: Kids Say the Darndest Things. Enjoy this reflection of what used to be and what I hope still exists somewhere. . .
Outside My Window. . . winter's grasp tightens once more. Last night a violent wind brought in another storm, and this morning everything is covered with 5 inches of heavy, wet snow. The wind is still howling and will make travel treacherous today. I am thinking. . . this latest storm is inconvenient, but it is packed with wonderful and much needed moisture. I will try not to grumble about shoveling it off of the walks and drive. I am thankful... that I am no longer teaching. A friend stopped by for a visit yesterday, and hearing of the changes and struggles at my former school made me very thankful that I do not have to deal with the ever extending schedule and the stress of state testing. Leaving education was difficult for me, but now I am certain that if I had stayed, my health would be much worse: the stress alone would have been too much. In the kitchen... breakfast is delayed. I have lab work this morning so breakfast will have to wait. I am wearing... my typical casual outfit. I am creating... a gray wool, cropped cardigan. I am making slow progress. I am planning... a support group meeting on Saturday. I am reading... nothing at the moment. I haven't had time to go to the library. 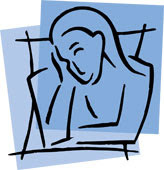 I am praying... the weather cooperates so the support group members will have good roads for Saturday's meeting. I am hearing... the sputter of coffee maker as the last bit of water is pumped into the filter. One of my favorite things... frosted sugar cookies. My friend Deb brings a half dozen of these treats when she visits. They are always yummy! A Few Plans For The Rest Of The Week. . . a) lab work, b) doctor's appointment, c) annual yard sale with a group of friends. A photo worth sharing. . . 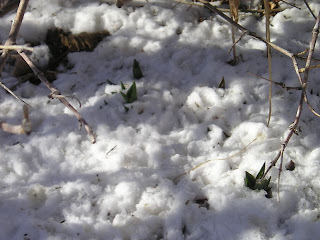 The tulips survived last week's storm, but their little heads are covered with an even heavier blanket this morning. Somewhere under there they are struggling to be the harbingers of Spring. I finally figured out how to attach a lacy border to an Oddball blanket. You may remember that I tried to add a border to Creamsicle but failed miserably and had to frog my attempt. 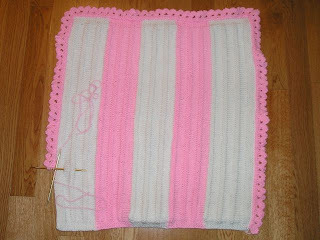 I sent the blanket to Kaniger who added a gorgeous border and transformed Creamsicle into a beauty. 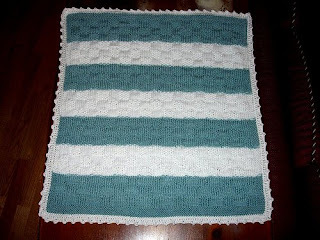 I knew there had to be a way to knit the border to the finished blanket, and when I read how to apply an I-cord to an existing garment in Knitting Around by Elizabeth Zimmerman, I knew that I had my solution. You can read about the technique here. I used three double-point needles. One needle picked up stitches (EZ recommends 12 - 15 stitches at a time). The other two needles were used to knit the actual lace border. Instead of knitting the last stitch (on the right side), I slipped it and knit one of the picked up stitches. 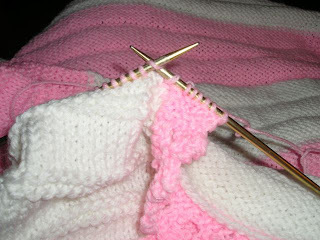 Then the slipped stitch was passed over the last stitch (the picked up stitch that was just knit). It was slow going, but once I got into the rhythm of the process, it went smoothly. 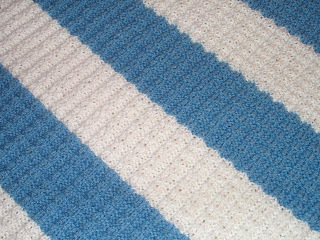 I used the Bird's Eye trim stitch from Lionbrand's site. 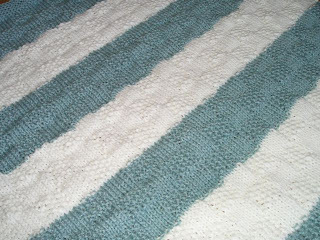 Since the stitch is knit sideways, I knew that I could knit it on the blanket edge flat rather than in the round. I was on a roll but anxiously watching the diminishing ball of yarn. Nearing the last corner, it was clear that I was in trouble. I hated to go buy another skein of yarn to finish the border, but it was either that or frog and start over with white yarn. I chose to go to Walmart and purchase a skein that was close in color. It was a bit lighter than the original, but it is not too obvious. Little Princess was created from yarn in my stash and an ounce and a half of a new skein. This was a fun experiment. Now that I know it is possible to edge the blankets, I may do it again. Sorry that I haven't posted all week and that I worried some of you. 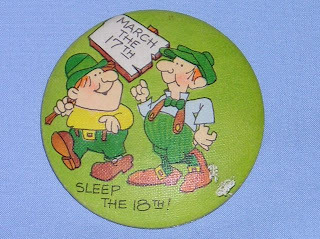 I could blame it on the lousy, "spring" weather (snow, wind, cold), but mostly I have been just plain lazy. I've done very little all week other than take naps and sit and stare out of the window at the horizontal snow. I did some knitting on a new Oddball blanket but nothing else. I have no desire to do anything else. I guess it could be called the doldrums. So here I sit waiting for the tide to change and toss my ship to and fro so I can resume my journey. Outside My Window. . . winter has returned. A cold, wind is blowing, and the ground is covered with snow. I am thinking. . . of walking to the mailbox. I dread walking in the wind. I have been known to drive to the mailbox when the weather is bad which is pretty pathetic because my mailbox is only a half a block from my house. I am thankful... for all the moisture in today's snow. In the kitchen... the groceries I purchased are waiting to be put away. I found some really good bargains at Safeway this afternoon. I am wearing... a long-sleeve fleece top and black pants. I am creating... a short-sleeve sweater for myself. I have been talking about this sweater for months, and now it is on the needles. I am praying... that our leaders can get things straightened out. I get so discouraged when I read and see the news, but I will continue to pray, and pray, and pray. I am hearing... the wind. Something to ponder: does the wind make noise or is the noise caused by the the items that are subjected to the movement of air, i.e. a flag, the trees, the dirt? One of my favorite things... a neat room. Of course, it is a rarity in my house. A Few Plans For The Rest Of The Week. . . I don't have any specific plans this week. Remember the game, Chutes & Ladders? I remember begging my sisters and brothers to play the game with me before I started school because I enjoyed playing it so much. I wish I knew where the game board was because it would fun to frame it and hang in it my house. This Oddball blanket (knit with the Checks & Ridges stitch) has been named Chutes and Ladders based on those great times I had as a child. 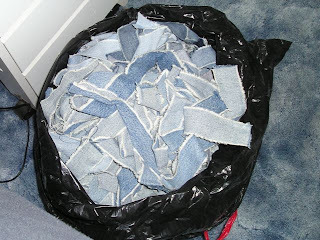 Last summer, I spent two afternoons striping piles of blue jeans (about 20 - 25 pair) for the rugs that I make. I do the striping outside because it is so messy with lint and strings going everywhere. 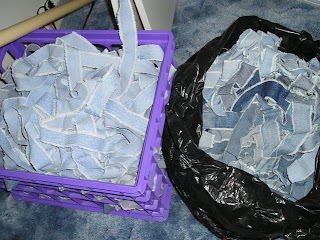 Very little of the jeans go to waste. 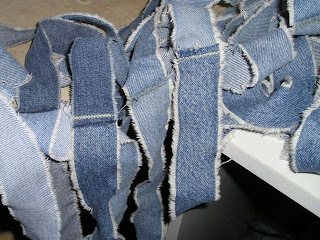 The denim strips are ripped about 1 - 1 1/2 inches wide from the cuff to the pockets. 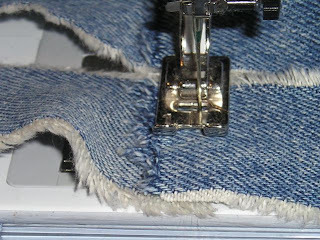 All of the loose strings are removed from the strips. Yesterday, I found the bag of strips in the garage and began the process of sewing them together. The bag was stuffed with the strips. The strips were chain-stitched and placed in a crate. As the pile of strips in the crate grew, I could not see the bottom of the bag. Was I making any progress? Then, the end was in sight. The crate was filled, and the bag was empty. The crate filled with strips turned into this. 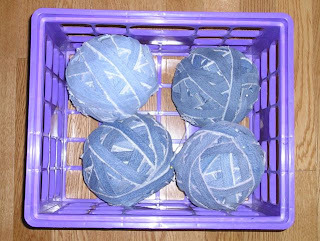 . .
Four balls of denim strips (enough to make four rugs) ready for the rug frame. I fold the strips in half as I roll the ball, and by the time they are needed, the strips lay flat. 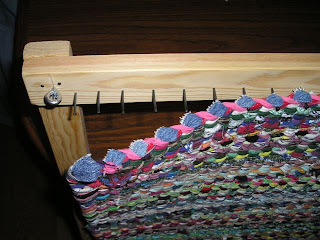 On the frame, the "pressed" strips make it easy to work with the weft. 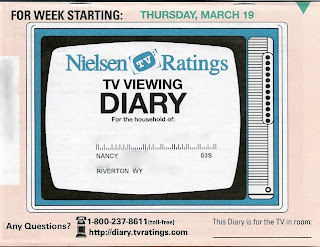 Today is my "official" day to begin tracking my television viewing; however, it will not be a valid reflection on my "typical" viewing routine. Why? Simply stated, March Madness and all the hype that surrounds always seem to dominate my favorite stations and preempt my favorite shows. I do not watch the Madness because I cannot stand to watch any sports on TV. At least my diary is going to show my preference on that issue. 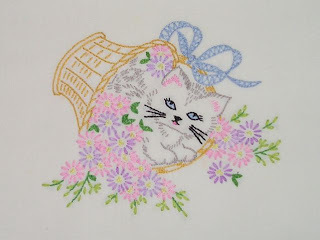 * Note: my issues with Blogger disappeared as quickly as they appeared. I have no idea if anything I tried was the solution or if it was something beyond my control. only in the anticipation of it. I could hardly contain my excitement when I opened the boxes that contained my Knit Picks order. I had waited two weeks for the contents, two weeks of intense anticipation, two weeks of delayed gratification, and two weeks of fear. At the bottom of the box was the item I have delayed purchasing: Knitting Around by Elizabeth Zimmerman, and now it was in my hands. I settled in my favorite chair and began to scan the pages. I nearly purchased the book before, but I was turned off by Zimmerman's style of writing. I lack confidence in my knitting skills, and her "patterns" are somewhat difficult for me to wrap my head around. I have decided to just take the plunge and try: it is a big leap of faith. I want to make the Pie Are Square Shawl, the Moccasin Socks, and the Bog Jacket. If I have too much difficulty, I will order the companion DVD. The other items round out my knitting tools collection. Knit Picks recently added the tools to their catalog, and the price is very reasonable. I hope to conquer my fear and actually knit these items. I hope that Alfred Hitchcock's observation is correct and that the terror is only in the anticipation. 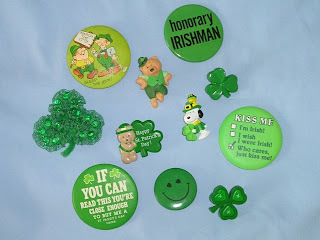 As a teacher it was imperative to wear green on St. Patrick's Day. My collection of pins kept me safe for years. This pin is my favorite. I present #23 -- March's goal has been met. Outside My Window. . . the day has already started and here I sit with sleep still in my eyes and being lazy. A light breeze blows the plastic bag scraps that are snagged in my front tree. Weatherman is predicting temperatures in the 50s today, but with snow on the ground, it doubt whether it will be that warm. I am thinking. . . about my childhood and the mornings that I walked to the county road and waited for the yellow school bus to come lumbering up the road. To pass time, I would break the ice on puddles along the side of the road. Other times, I would scamper (I could scamper in those days) up the ditch bank and scan the horizon for the bus. How carefree my life was, and I didn't even realize it. I am thankful... for another Monday morning with no commitments. I woke early, rolled over and went back to sleep for another hour. In the kitchen... the rug frame is leaning against the table with only two inches remaining to twine. I am amazed that I will have accomplished my goal for another month. 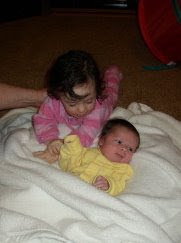 I am creating... the twined rug, of course, and another Oddball baby blanket. I am planning... a May support group meeting in Cheyenne. It is difficult to plan and coordinate when I am not familiar with the local resources and meeting places. It is gradually coming together. I am reading... Sundays at Tiffany's by James Patterson. I am praying... for the homeless, especially the children who don't understand why their world has been turned upside down. I am hearing... the ringing of a cell phone from my bedroom. Of course, that is impossible since my phone is in another room, so the sound's source must be the radio. It sounds realistic and definitely fooled me. One of my favorite things... Scrabble and other board games. Nothing beats a good game with a friend or a group of friends. No batteries required. A Few Plans For The Rest Of The Week. . . none at this time. 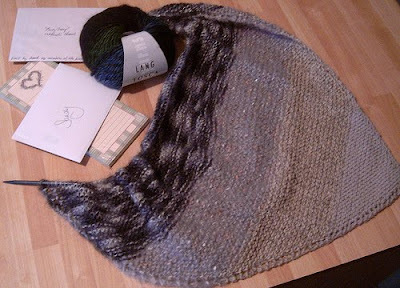 Misty Greys, a new Oddball Shawl, arrived in the mail today. I knit my required four inches, using some reclaimed, wool yarn. 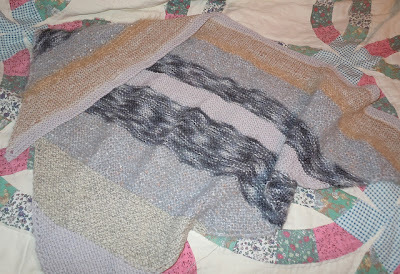 This shawl will travel to other knitters and return in a few months so I can add another section. 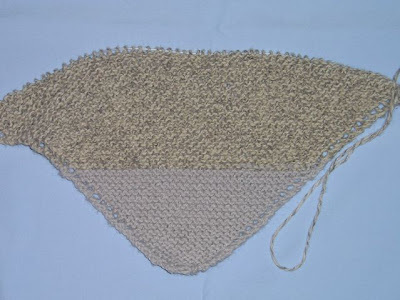 April 2010: The shawl is gradually taking shape, but seems to have been "lost" as I haven't heard any updates for a long, long time. 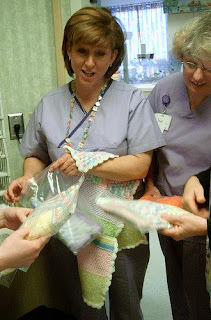 Recently, the original coordinator of the Oddball Baby Blanket project took 16 of the original Oddball Preemie Blankets to Carolinas Medical Center, Union in Monroe, North Carolina. She said the nurses were so appreciative of the blankets. 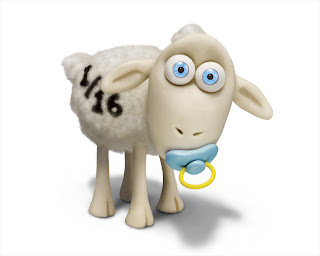 Sandy reported: one of the nurses said, "I want to learn to knit!" Another nurse kept saying, "Wow! I just keep getting goosebumps! This is such a neat thing!" 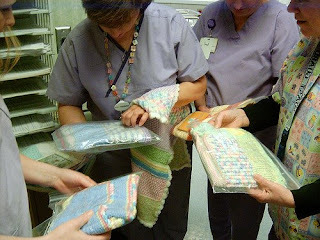 Sandy reported that the nurses just went on and on about how pretty the blankets were and spoke about the beautiful stitches. 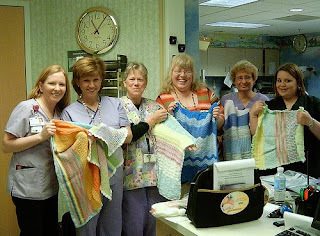 The nurses were very gracious and were willing to pose with Sandy (the coordinator) holding some of the blankets. She said it was a great experience! Seeing these photos warmed my heart. When life sends you snow, what do you do? Since yesterday was snowy and windy, I listened to The Gingerbread Girl by Stephen King and knit. 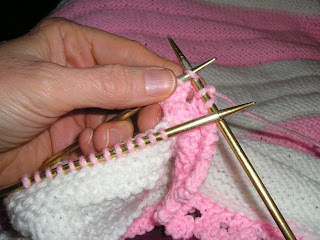 The book was very good, and I got caught up in the suspense a couple of times and lost track of my pattern stitch. 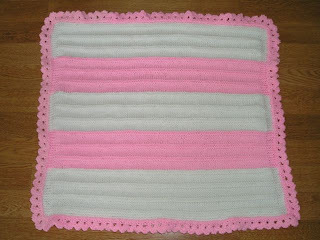 I know there are mistakes that I didn't catch in the blanket, but I tell myself that adds to the charm. I made this for the West Coast Oddball knitting group from yarn in my stash. Got any ideas for a name? 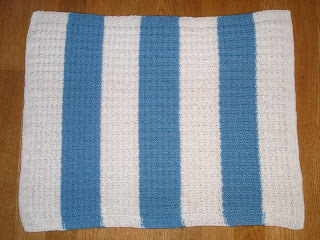 I have been toying with Snowdrift, Snowflake, Arctic Ice, but I am not sure what to name this blanket. What do you think it should be? By consensus, its name is Arctic Ice. Outside My Window. 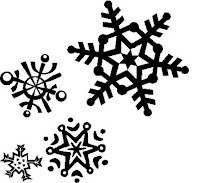 . . a light snow is falling. It is so fine that it is difficult to see unless highlighted by a dark background. It appears to be persistent and will probably fall all day, leaving a measurable accumulation. I am thinking. . . about making a short road trip this week, just to get out of town for a day. I need some new scenery. Today's snow may delay the trip. I am thankful... that I can stay home today. Another volunteer wanted to work my shift at the hospital today. I got to sleep in on a snowy day, and I don't have to get out in the snow. Life is good. In the kitchen... the ingredients for a pot of soup are on the counter. Snow days are perfect for making soup. I am wearing... my robe and pajamas. I am being lazy this morning, remember. 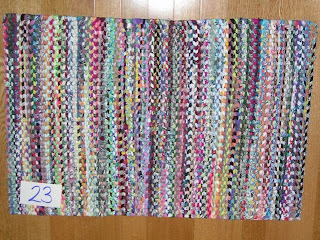 I am creating... another Oddball blanket for the West Coast group from my stash. 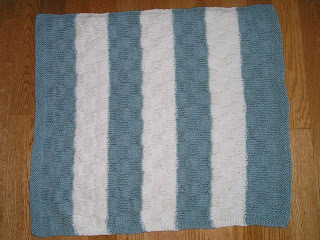 This one is blue and white stripes, using a seed block stitch. I am planning... to start another within the next week or two. I am reading... nothing at the moment. I just finished Forever Odd by Dean Koontz and plan to begin The Gingerbread Girl by King next. I am praying... for patience. I am hearing... the drone of an airplane, preparing for landing. I can almost tell time by their approach during the day. One of my favorite things... a warm bubble bath, a good book, and a cup of tea to soak life's worries away. "I had a farm in Africa at the foot of the Ngong Hills. . ."
Those words have haunted me since the first time I saw the movie, "Out of Africa." I have no idea how many times I have seen this movie (probably dozens) but each time it fills me with admiration for Karen Blixen. Meryl Streep protrays Blixen as was such a strong woman. Each time I watch the movie, I tell myself that I need to read Blixen's books and stories research her life to see how much of the movie is based on fact. I haven't done that yet, but a quick search today gives me an idea. I still want to read Out of Africa and Letters from Africa, but for today, I am once more lulled into a different world and a different time by the words, "I had a farm in Africa. . ."
Ironing was one of my assigned chores when I was growing up. My mother started me with pillowcases and dresser scarves. When I had pressed them to her satisfaction, I was promoted to ironing my brother's shirts. I liked to see the row of hangers on the top door frame, displaying the crisply, pressed shirts. 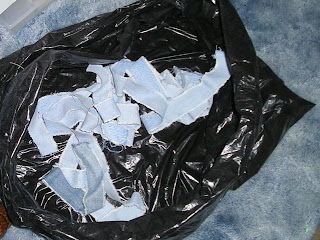 It was essential to dampen the fabric to aid in the process. I remember using a bowl of warm water, dipping my fingers in it, and then flicking the water off of my fingers onto the fabric. 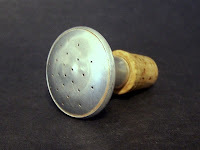 Mom also had the cork device with holes in the top that was placed a top a soda pop bottle. I preferred the finger-flicking method to the bottle topper. 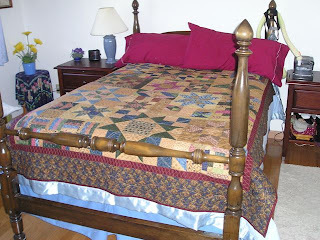 One by one, the pillow cases, scarves, and shirts were dampened and rolled and placed at the end of the ironing board. By the time all of the items were dampened, the first items were ready to press. 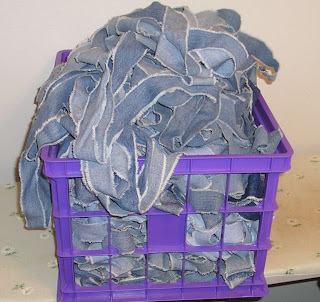 To me, the smell of that damp fabric being pressed with a hot iron was heavenly: it smelled of the sunshine because all the laundry was sun-dried. Now, of course clothing can be pulled out of the dryer before too many wrinkles set in, but ironing is still necessary for 100% cotton items. The spritzer bottle has replaced finger-flicking. Yet, with all the modern conveniences it is hard to obtain a nice pressed finish. At least, it was until I discovered Mary Ellen's Best Press. I love this product! I haven't had such nicely pressed pillow cases in years. It is easy to use and makes ironing effortless. My iron just glides over the fabric and even deep-set wrinkles disappear quickly. In my opinion, Mary Ellen is a genius. 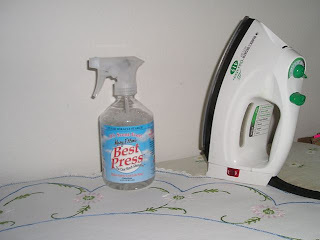 If you have vintage linens that need pressing, I recommend this product. If you want to add a light touch of starch to your favorite cotton shirt, try Best Press. I don't think you will be disappointed. The second block for March is finished, shown at bottom right. For some reason the recent blocks are not the same size as the February blocks. I checked all measurements twice and used the most scant seam I could, yet they are smaller. I guess they will have to be framed when I assemble the quilt top. Once the blocks were on the wall, I determined five fabrics was too many to incorporate in the blocks, so the gold in the original block will not be used. 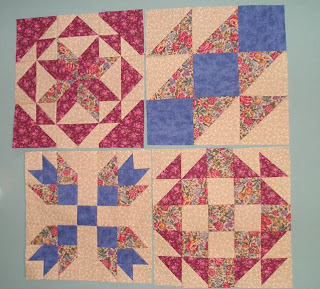 The top right is the revised January block, sans gold. One of the hardest parts of this Sampler project is not knowing what the block pattern is going to be or how it is going to look. My blocks are not the intended size, my points don't all match, and the color scheme may be wacky, but I am learning more with each subsequent block. That was my goal, so I am happy with my progress. 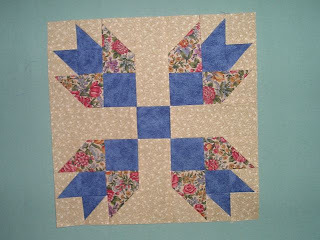 I finished the first of two March blocks for the Ugly Sampler Quilt last night. It is easy to stay motivated by doing a block or two a month. The pieces for the second March block are cut out and ready to assemble. Hopefully, I can get to that this afternoon. The Stashbuster project started with these two blocks in February. Today's Delivery was a new box springs and mattress set. My old set, purchased in 1991, was loooong past due for replacement, and when I began to have hip and back issues, I knew a new set was necessary. The new set is much thicker than the old, and I am not happy about investing in new sheets. I love my percale sheets that are older than my old box springs and mattress. They are still in great shape and feel divine. In my opinion, today's sheets are coarse and are poorly made, except for those that nearly require a bank loan to purchase. Another disadvantages of the new set is its weight: I know that I will not be able to rotate it by myself. Care to guess what I am having delivered today? Outside My Window. . . are the makings for a beautiful spring-like day. To the east is a faint glow of gold: the sun is breaking the horizon; to the west, a bank of clouds signaling a change in the weather - a storm or maybe just wind. On the air is the faint smell of damp earth. I am thinking. . . of the month ahead and of the projects that I am planning. I am thankful... that winter's grasp is loosening. In the kitchen... the water for my tea is sputtering on the stove. I am creating... the final (it is possible?) pair of socks from the scrap yarn bag. One sock is passed the gusset, and the other just had the heel turned. 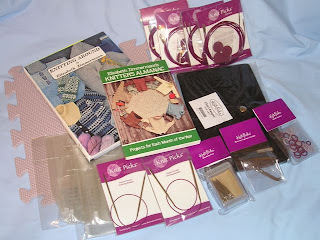 I am planning... to do more sewing this week. 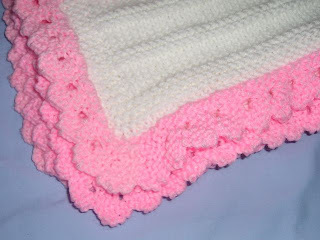 I have more baby blankets to make and some taggy ribbon blankets with the scraps. I want to finish working with the flannel before the end of the month. I am reading... Forever Odd by Dean Koontz. I am making slow progress. I am praying... my doctor can give me some answers on some recent concerns. I have an appointment today. I am hearing... the neighbor's pickup idling. It's comforting rumble reminds me of a purring cat. One of my favorite things... Fitted Sheets. How on earth did people manage to keep a bed made without them? I am certain the inventor must have been a woman.